Nina Makes Tracks: Mt. 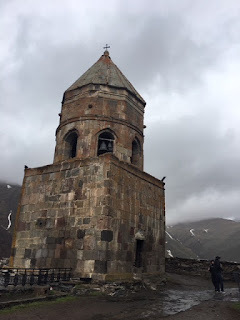 Kazbek Yes, Ushguli No. 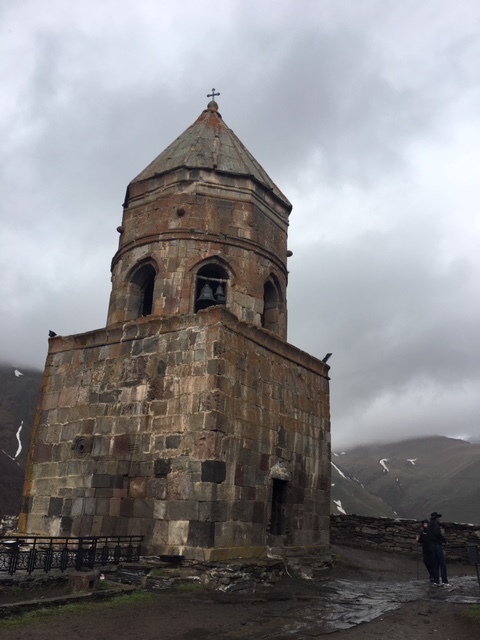 I swear I didn't want to go on that so-called "exciting" jeep ride, via treacherous terrain, all rocks and mud, up the mountain, just to see a monastery. Oh, and a breathtaking view of the Caucasian mountains. But I did, and lived to tell the tale, so here I am. I think I was nervous because of several horror stories (i.e., news items) within the past few years that told of Israelis who were badly injured, or even killed, on that or other treacherous roads in Georgia. One woman fell off a horse. One family's ATV overturned and crashed; and I was sure I read about one young woman who went flying out of the rock-bouncing jeep; but I googled it and couldn't find any evidence of such a story. Be that as it may, when the moment came, and I saw the laid-back, been-around-the-block (or around-the-mountain) driver, not to mention the line of muddy vehicles that were on their way back from the top of the mountain, I just got on board. And tightened my seat-belt. Despite Mr. Driver's assurance that "it wasn't necessary". It was a very rocky ride, to put it mildly. As the so-called "road" climbed higher, the mud got deeper, and scattered ATVs around us were furiously changing gears and attempting to make way. My Fitbit can attest that my pulse was far higher than normal. As you can see above, I am more-or-less dressed for hiking. There were girls around me, though, who were shivering in their fashionably-torn-to-shreds jeans, stylish shoes with cutesie ankle socks, with neither a hat nor a scarf. Do not adopt a macho attitude, do not attempt to drive that route yourselves, do not even think of using anything but a reliable 4x4.